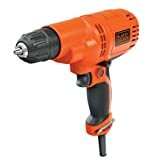 The Black & Decker DR260C 5.2 Amp 3/8″ Drill/Driver is powerful and compact, capable of handling tough tasks in tight spaces. This drill operates from 0-1,500 rpm, features a keyless chuck for quick and easy bit changes, along with variable speed for controlled drilling and driving. The on-board bit storage allows for quick access to screwdriving bits. This drill is perfect for drilling holes in wood, metal and plastic, and driving screws to fasten a variety of material. Includes: (1) DR260 Drill/Driver, (1) Double-Ended Screwdriving Bit.